This is a guest post by Charlene who blogs at My Frugal Adventures. I used to think you needed to shop at discount grocery chains to get the best prices on grocery items. I had two chains that I shopped at regularly despite being out of the way and pretty run down stores. 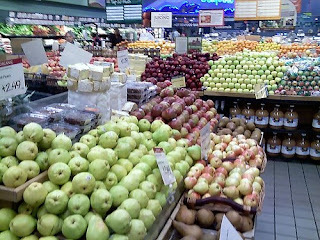 I found I would have to make second and third trips to other stores as the produce was not fresh or the selection was very limited. Then I discovered the art of shopping loss leaders. I live in a high cost of living area with very expensive grocery chains. In Northern California we do not have double coupons, which makes finding great deals even more challenging. I have discovered higher end grocery chains frequently feature surprisingly low prices on items every week in the ads. Some-like Safeway- also feature weekly store coupons that can be stacked with manufacturer coupons to double the savings. I have been amazed at how much money I have shaved off our weekly grocery bill by shopping at the more expensive chains and simply buying the loss leaders featured in the weekly ads. * Check the ad weekly and buy the loss leaders (or items featured at substantial discounts to attract people into the store). * Create a menu plan based upon what is on sale that week- if chicken is an incredible buy you can probably come up with several totally different menu ideas featuring chicken and items from your pantry. *Stock up when prices hit rock bottom. When my local store had whole wheat bread for .99 a few weeks ago and I had $1 off coupons, I purchased 5 loaves to freeze. This will last us until the next sale cycle when bread hits rock bottom again. *Look for clearance or discounted produce/meat and bread. Since the quality standards tend to be higher at the more expensive chains I regularly find lunch meat on clearance for .99 that I can freeze, bananas that are perfectly ripe for 50% off and day old bread for 50% off or more. *Combine store coupons with manufacturer coupons to save even more. Many higher end chains feature weekly coupons in the ads, online or in store coupon books. Look for those coupons and match them with manufacturer coupons. I just purchased 2 packs of Mission Tortillas for .24 each by combining a Safeway store coupon and manufacturer coupon. My local discount chain has the same tortillas priced at $2.99. So take the time to look through the circulars at all the grocery chains in your area- you may be surprised at what you find! To find the best deals at grocery stores around the country check out BeCentsable’s Grocery Gathering. Charlene is a busy mom of two little ladies in California. She can be found at My Frugal Adventures and is always on the hunt to bring moms the very best deals to stretch those hard earned dollars. I now live where there are no double coupons. When I did, I used the doubles, but wasn't afraid to shop loss-leaders at the local High End. Products were usually better, but since I was aware that I was in the HE store, I did much less impulse-shopping. Kroger is no longer right around the corner. I am so glad someone wrote about this. In my very rural area Walmart and Food Lion are thought to be the places to shop for the lowest prices, but I find Kroger has the best prices almost always. And with Kroger you get additional savings on gas making it an even better deal! When I lived in South Florida I always found Publix to have better deals over Winn Dixie although the impression was otherwise. Great tips. I need to get more organized with my savings plan. I rarely have coupons and weekly fliers together or I miss both. It truly is an art form, but at least I always use coupons.